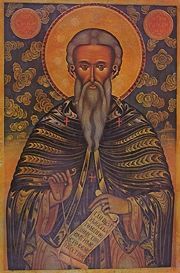 Saint John of Rilas founded the renowned monastery of that name in Bulgaria in the tenth century. Over the centuries, great and wondrous healings have flowed from his holy relics. Emulating the life of the Angels, O Saint, and leaving behind all earthly things, thou didst run unto Christ. And protecting thyself with His commandments, thou wast shown to be a pillar that no attacks of the enemy could shake. Wherefore, we cry to thee: Rejoice, O Father John, most brilliant light. Share the feast of John of Rilas with an icon greeting ecard.